Need a great wedding band? Then this unique cobalt xf chrome 8mm Celtic wedding band will be the perfect answer for those who want a great wedding ring without needing to finance the purchase. 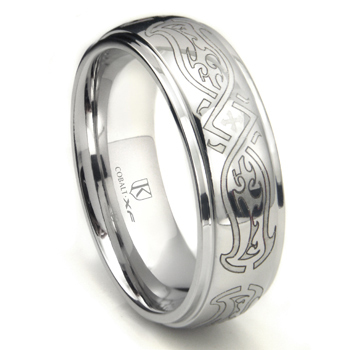 Made of high polish cobalt chrome with white gold color, the wedding ring is engraved on the surface with a Celtic design. This design is a first of its kind with cobalt chrome. Further the men's wedding band features comfort fit design to ensure a comfortable fit and feel when worn daily. Our cobalt xf chrome 8mm celtic wedding band is perfect for those of Gaelic tradition when it comes to having a wedding. One of the best features of a cobalt chrome ring is they are not too light nor too heavy, to be worn each and every day. This makes it perhaps one of the best wedding bands to symbolize eternal love. Our rings are also very affordable and as an added feature are hypoallergenic so you won't develop and allergic reaction when wearing the ring. Great service, great ring! Thanks for delivering!